The automated farm has sprung to life this fall, as a farm in the United Kingdom became the first in the world to successfully plant, tend and harvest a crop entirely with autonomous vehicles and drones—and without a single person ever setting foot in the field. The human workforce was replaced entirely by IoT tools operated from a team of engineers in a control room. These farming tools did everything from sowing the seeds to picking the grain. The project, called Hands Free Hectare (HFHa), was completed in October and had a yield of 4.5 tons of barley, according to news releases. 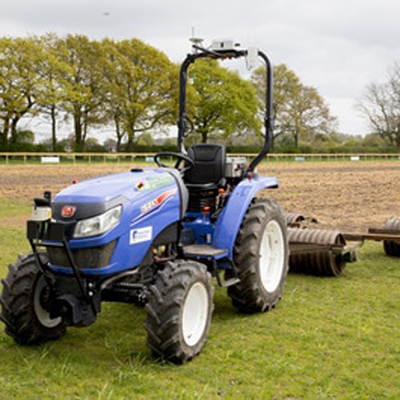 The automated farm was a joint venture by Harper Adams University in Shropshire, England, and Precision Decisions, a farming technology specialist based in York, UK. The project, which cost approximately UK£200k, was funded by Precision Decisions and the UK funding agency Innovate UK. It used machinery that was readily available for farmers to buy, including open source technology and an autopilot from a drone for the navigation system. The project team used a customized Iseki tractor for spraying, drilling and rolling. The tractor is smaller and lighter than most tractors used in the industry. The team kept the idea that smaller was better in place with its customized harvester, too, staying true to the concept that the use of smaller—and smart—agricultural machines could improve soil and plant health, ultimately leading to a better yield. Gill noted that the weather is a big issue when farming, as only small windows are available for work to be completed because of the rains in the location they chose. “The rainy weather is part of the reason machines have been getting so much bigger. Farmers here need to be able to complete work quickly. The autonomous vehicles solve that issue. “In the future, farmers will manage fleets of smaller, autonomous vehicles. These will be able to go out and work in the fields, allowing the farmer to use their time more effectively and economically, instead of having to drive up and down the fields,” Gill adds. At Hands Free Hectare, agronomists and engineers used the small customized tractors along with several drones to cultivate the barley from an area roughly equivalent to two and a half acres. Drones with multispectral sensors took aerial images of the field. Smaller machines at crop level took samples to assess what fertilizers to apply and where. The team also used live camera feeds to detect invasive weeds or disease. Autonomous farming tools and the IoT are taking root in all areas of agriculture, continuing to transform the industry and how it does business. According to BI Intelligence, IoT device installations in agriculture are expected to increase from 30 million in 2015 to 75 million in 2020, for a compound annual growth rate of 20 percent. While the majority of the attention paid to IoT-powered technology investment in agriculture has been focused on improvements related to increasing the yield in precious crops, IoT also offers farmers savings in labor costs. The rising cost of labor is a huge driver in the field of agriculture technology, explains Matt Nielsen of Autonomous Solutions, in a recent CNN.com article. Autonomous Solutions is a Utah-based company that converts vehicles from manual to robotic control. "Autonomous vehicles (on the farm) make sense when you compare the cost of technology to the cost of labor." With the success of the first automated harvest, Hands Free Hectare plans to continue its research into development of more farming technology. The team also intends to plant a full crop of winter wheat using the same methods. In the meantime, the team says they plan to celebrate their success in IoT by brewing their own beer—made from their first barley harvest. Dig up more about the automated farming harvest and the solutions used by the team at Hands Free Hectare or follow their progress on Twitter @FreeHectare. Melanie is an expert technology writer who specializes in covering the IoT, cloud, mobile computing, and emerging technology markets. Melanie has held top editorial and content development positions at Allbusiness.com, Internet Business magazine, and LAN Magazine. She has written hundreds of global business technology articles and blogs and co-authored The Standard for Internet Commerce.